A few days ago I received an email from a fellow Trekkie with a question about quasars. As one does. "WHAT !?!? AN EMAIL THAT'S NOT FROM A PSEUDOSCIENTIST ????" "If quasars weren't extragalactic, what might they have (otherwise have been found to have) been ? Lest that sound too much like something from Velikovsky, rest assured I'm asking in terms of SF…or space opera anyway, for strictly Trek-related reasons. Let me explain. I breathed a sigh of relief at the Velikovsky dismissal, because I've had just about enough of dealing with wackos who think they understand science better than scientists. But I digress. As you may or may not know, Trek's episode "Galileo 7" cited Kirk's "standing orders" to "investigate all quasars and quasar-like phenomena." This order was cutting-edge in 1967, when quasars' nature and location(s) were unclear. Today it's an anachronism…but my bent for "aired data is factual" Treknological speculation has me longing to be able to say more than, "If taken at face value, these orders imply the very COSMOS of [original series] Star Trek differs fundamentally from our own." "
Well, indeed, I am acutely aware of the episode in question. 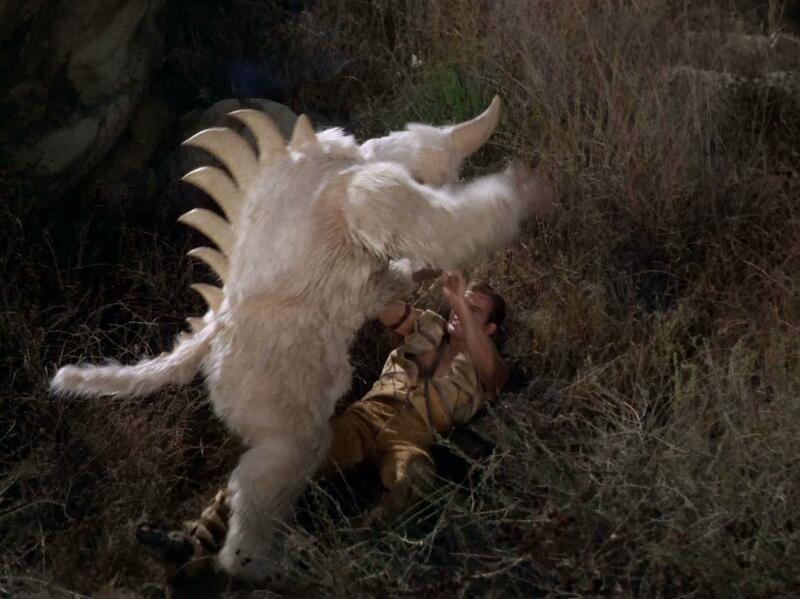 It's a great episode where we see some fundamental character conflicts that were barely seen in later Trek seasons. But the notion that Captain Kirk could take the Enterprise off on a study of quasars is, as everyone knows these days, just plain silly. Of course, the rest of the show was a masterclass in subtle understatement. What are quasars, anyway ? Quasar, for those of you not in the know, is a short form of "quasi-stellar object" : things that look a bit like stars, but aren't stars at all. They were discovered in the early 1960's using radio telescopes (that they featured in Star Trek as early as 1967 is a credit to the writers). The name comes from the fact that they were bright sources of radio waves but with only a star-like object seen in visible light. At the time, no-one even knew how far away they were, let alone what they were. 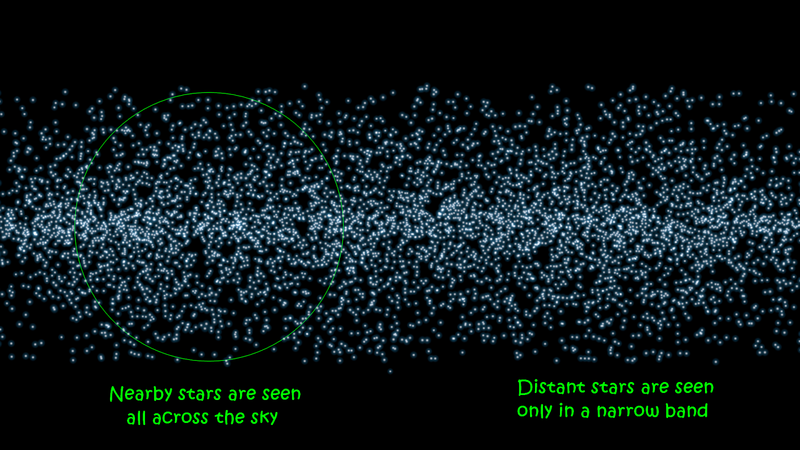 Pretty soon though, someone measured the redshift of one of them - that is, how fast it's moving away from us. It was found to be a whopping 48,000 km/s (a hundred million miles per hour, or nearly three hundred billion furlongs per fortnight) - much, much faster than anything in our Galaxy. Later, galaxies were discovered at the same positions as the quasars. So it's now a certainty - yes, really, a certainty - that quasars are very distant, incredibly bright objects. 48,000 km/s is about 15% of the speed of light, which is jolly fast. Accelerating something as big as a star to that speed takes an enormous amount of energy - roughly speaking the entire energy output of our Galaxy for a year. So for quasars to be natural, nearby objects is basically a non-starter. But other galaxies are doing this quite naturally - pretty much all of them, really (much more on this later). The more distant a galaxy is, the faster it's moving away from us, a discovery known as Hubble's Law though the real credit should go to Georges Lemaître*. * Interestingly, it seems that Hubble didn't believe redshift was really equivalent to speed, but we'll get back to that later. Anyway, quasars are tremendously far away (many hundreds of millions of light years), so they have to be extremely bright. But they can't just be unusual galaxies - as we've seen, their host galaxies don't look all that weird - because their brightness can vary on a timescale of days. Galaxies don't, indeed, can't, do that. Whatever quasars are, they have to be small - no more than the distance light travels in a day or so (about 26 billion kilometres, several times the distance to Pluto). Since nothing can travel faster than light, if they were any larger than that there's no way the change in brightness would vary consistently across the object : some parts would be bright while others were dim, and vice-versa. It would all cancel out so it would look like there was never any variation at all. The idea is that quasars look different from different viewing angles. So if we happen to be looking straight down the jet, they look very bright; if we're edge on and looking at the torus, they're dimmer. Image author unknown. A huge black hole (by the standards of black holes, which is still tiny compared to galaxies) gobbling up material which swirls around it in an accretion disc. Before it falls in to the hole itself, from which nothing can escape, it gets hot and radiates energy. It turns out that accretion is one of the most efficient ways to release energy, second only, perhaps, to a matter-antimatter explosion. This is not so much because of the mass of the black hole, but more because that mass is very concentrated. Imagine you dug a hole right down to the center of the Earth, and, feeling reckless, you jumped in. Obviously, you'd get faster and faster. But while your speed would always increase right until you met a miserable fate at the bottom of the hole*, your acceleration would steadily decrease. The further down you went, the less mass there'd be pulling you down. For a solid sphere, it turns out that you only feel the pull of gravity from the mass beneath you - all the mass above you cancels out. * I said you dug a hole to the center. I never said it went right out to the other side. Not so with a black hole. To squish the Earth into a black hole we'd have to make it about the same size as a pea. Let's suppose we were clever and stupid enough to do this. Well, we'd suddenly find ourselves floating in space with a black hole now around 6,000 km below our feet. We'd start falling... but this time our acceleration wouldn't decrease. It would get higher the closer we were to the hole. All of the mass of the Earth would still be beneath us right until the bitter end - which means we end up with a much higher final speed (as in near light speed, though things get horrendously complicated with such strong gravity), releasing more energy. Funny thing though - our initial acceleration wouldn't have been any greater than if we'd dug a hole. Turn the Sun into a black hole and it wouldn't start sucking everything in, in fact it wouldn't pull on us any more strongly than it does now. Even at where the surface of the Sun is now, the gravity wouldn't be any stronger - but get closer, and things get much, much worse. It's the concentration of mass that makes things go haywire, not the amount of mass. That's enough about science (said no-one, ever*). How can we reconcile what we know about quasars today with Kirk's standing orders ? Well... we can't. The Enterprise was limited to exploring our own Galaxy, it couldn't go flying off to study distant quasars. Unless... what if we got that whole redshift thing wrong ? * No-one worth knowing, at any rate. Bad news, we didn't. We know quasars are extragalactic because we've seen their host galaxies, remember ? But maybe we can make this work with what we knew about quasars in 1967. 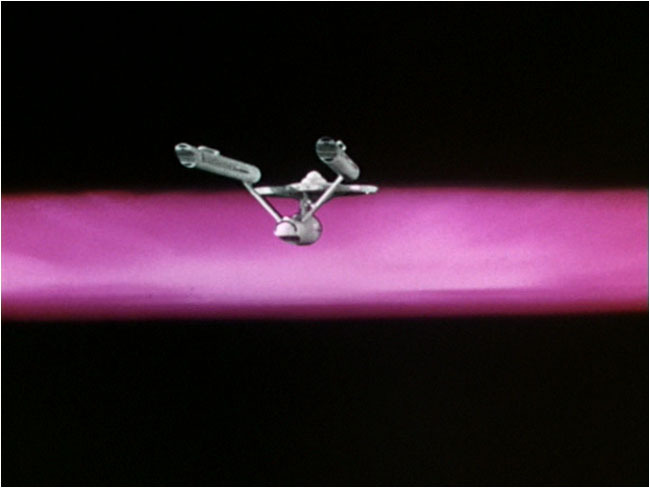 The "quasar" as it originally appeared in the show. In the remastered version it looks like this. The strictest definition of redshift is that the frequency (wavelength) of light is altered. It doesn't actually mean things are very far away or even moving very fast. There are actually three ways we know of creating redshift : 1) Expand space between us and the object; 2) Move it very fast; 3) Put it in a strong gravitational field. Expanding space is basically the real-world answer (that's why galaxies can have high redshifts), sheer speed is something we'll come back to in a moment, as is strong gravity. Suffice for now that the latter two have problems. Some astronomers were so startled by how frickin' bright they would have to be if they were as far away as redshifts would conventionally suggest, that they proposed a fourth mechanism : intrinsic redshift. The idea was that the light was emitted at at different frequency to begin with, but as to how this was supposed to happen was anyone's guess. It wasn't an outrageous idea, it just didn't work. So that leaves us with gravity and speed. If we have incredibly strong gravity, we can create the same redshift we'd normally mistake for extreme speed. From this formula, all we need is the size of the object, its distance and redshift, and we can work out its mass. We've got the redshift from the observations, so that's easy. We can place an upper limit on the distance given the size of the Federation (about 8,000 light years across) and the highest resolution observations available in 1967 (about 1" or 0.0003 degrees) - any larger than that and quasars would have looked like diffuse objects rather than stars, even with telescopes of the 1960's. Allowing the Murasaki quasar to be around 5,000 light years from Earth, this gives us an upper size limit of around 0.024 light years or 1500 AU. Aaar ! 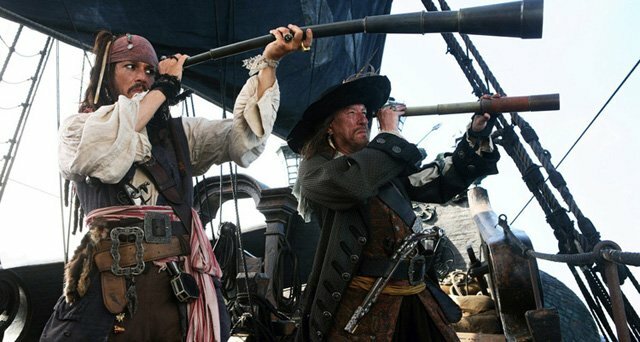 Thaat quasaaar be one aaarcsecond across, arrr ! That means we now have size, distance, and redshift, so we can work out mass - which turns out to be 9 billion times the mass of the Sun, or 15% of the stellar mass of the Milky Way. The density wouldn't be that great by everyday standards (about 300x less than water, about the same as ordinary clouds), but it would still be staggeringly huge compared to most of the matter between the stars. The free-fall time (for it to collapse to a point ignoring everything except gravity) would be about two weeks. This could be prevented if the gas was hot enough, but the temperature needed to prevent collapse would be around six hundred billion Kelvin. Or Celsius. Or Fahrenheit. At that temperature it really doesn't make any difference. An object that size with that temperature would have the energy output of five tredecdillion Suns. That's a number far larger than all the stars in the Universe. The energy received on Earth in one square metre would be the same as the total output of 200 Suns. This monster wouldn't be a planet killer, it would be a galaxy killer. Admittedly, I'm pushing the equations well beyond their breaking points, but the point is that a giant nearby quasar with strong gravity is a bloody stupid idea. But remember, the size limit was imposed only because of telescope resolution. Maybe we could still get equivalent gravitational redshifts from smaller objects ? Alas, not really. It turns out that to get a redshift of 0.15 (the lowest known), the light would have to be emitted from a radius only about four times the Schwarzchild radius, the size below which an object of a given mass becomes a black hole. As we've seen above, it's nigh-on impossible to get a large, stable object like a star that's so massive for its size. But couldn't we just do this by having material emitting light when it's close to the surface of a different object, like a neutron star or a black hole ? In my email response, I made a mistake and said that to do this would require emitting material to be below the Schwarzchild radius, which is impossible. But that's not the case at all. Theoretically, you can get any redshift you like if the material is close enough to the event horizon. Stellar mass black holes have event horizons ~10 km across, far smaller than the maximum 1500 AU size allowed by observations, so that's good. Emission that looks like it's at a redshift of 0.15 would have to come from around 350 km from the singularity. The problem is there's no obvious reason why the emission should peak at this distance - you'd have to somehow keep the material stable far above the hole itself, otherwise you'd see a much higher redshift as the material fell further in to the gravitational well. Also, apparently it just isn't possible to have material creating redshifts greater than 0.62, which are observed for many quasars. 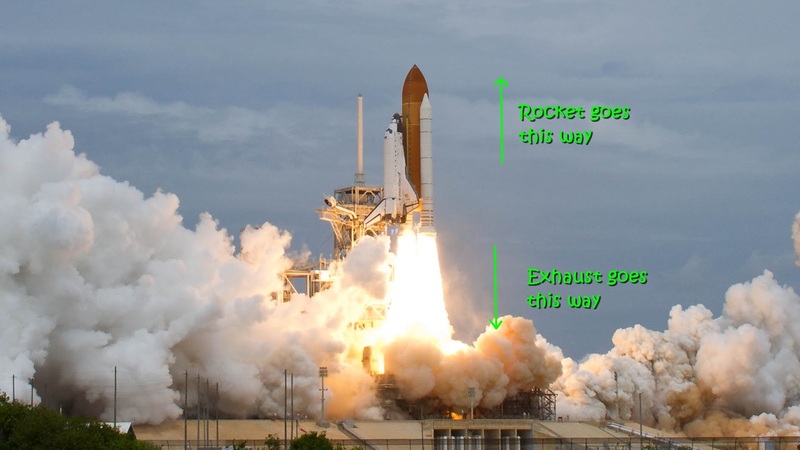 What about a rocket ? In the Trek universe, "aliens" are not only a perfectly valid explanation, but they're probably the most likely explanation. There's one alternative : white holes, a.k.a wormholes. Material falling into a black hole might be spat out of its opposite somewhere else in the Universe (but almost certainly isn't). Fortunately this one is easy to dismiss : in Trek cosmology, wormholes are very rare and very unstable (with one notable exception), nor do they ever eject huge quantities of matter. So these aren't a very likely explanation at all*. * Naturally occurring jets from black holes can also reach tremendous speeds. The problem is that each black hole has two jets, pointing in opposite directions. So if quasars were actually black holes in our own galaxy, we'd see this second jet. So natural explanations are out. Which leaves the question : what is it the aliens are accelerating up to such high velocities, and why ? Obviously, nothing larger than 1500 AU in diameter, but things which are bright enough to look like stars. So, stars then ? Well, as I mentioned, this would take a tremendous amount of energy, equivalent to the mass of a small asteroid in anti-matter. That's an awful lot in the Trek universe, but not out of the question. 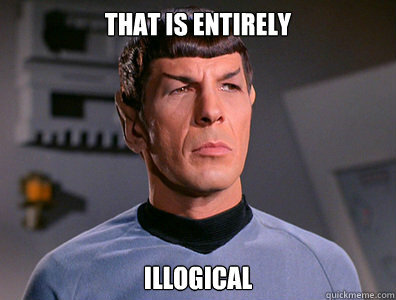 Also, of course, Trek science allows for faster than light travel - in reality this requires infinite energy. 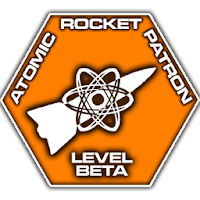 So maybe with Trek physics there could be a way to use far smaller quantities of anti-matter to achieve the same result. There are a couple of other interesting observations about quasars that are also relevant in working out what the aliens are up to. One is that there are no quasars with blueshifts - they're all moving away from us, unlike some galaxies. That means that - accepting that quasars are not extragalactic, for the purposes of Kirk being able to visit them - they have to be a purely local phenomena. If other galaxies were spewing out there own quasars by some natural process, we'd see some of them heading toward us*. 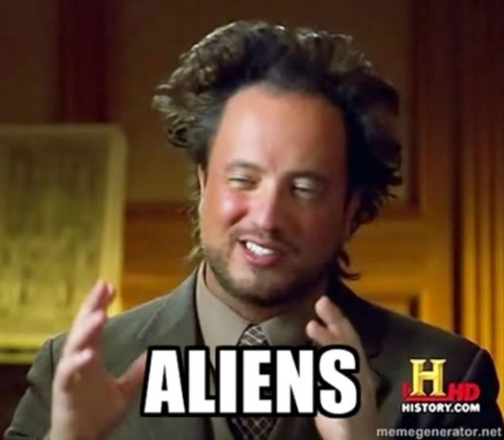 Which makes "aliens" a very plausible explanation indeed. * In the real world, we don't see this because quasars are almost exclusively found in very distant galaxies, where the expansion of the Universe is much greater than their peculiar velocities. The other interesting nugget is that quasars are found more or less evenly across the whole sky. Stars, of course, are not distributed like this - because we live in a spiral galaxy we see a band of them across the sky. Those outside the band are nearby. With Earth at the center of the circle. In reality, that means that quasars - if they are basically weird stars - have to be very close, within 2,000 light years or so. But since we've constrained quasars to be a local phenomenon distinct from stars, with redshift indicating speed, that's no longer the case. They can't be too far away though, or their density will be so low that Kirk is never going to be able to visit any. Say a cloud of about the same diameter as the Milky Way. A huge cloud of star-like things rushing away from Earth is a plain ridiculous explanation in the real world, but totally satisfactory if you're allowed to say, "because aliens". 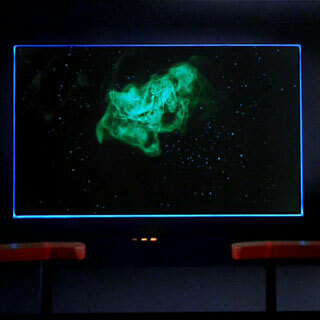 Making this cloud about the size of the Milky Way also means that only a very few quasars will be within range of a Federation starship, so Kirk's orders then make a lot of sense. Not too close - or the Feds would already have investigated hundreds of the buggers - and not too far away, otherwise there'd be none to visit at all. I mean, come on. A bunch of mysterious objects rushing away from Earth ? It could hardly be more sci-fi. A mega-engineering project to hurl stars out of our Galaxy is one possibility, a more obvious explanation is that quasars are in some way alien spaceships themselves. Initially, I rejected the idea of star-hurling for several reasons. The energy requirements are huge, and their isotropic distribution implies something like an explosive event. But would the alien spaceship interpretation be any better ? Given the brightness of the brightest quasar, and assuming it to be at a distance of 5,000 light years, it would be about 400 times as luminous (that is, its energy output) as the Sun. That's equivalent to combining 4 million tonnes of matter with 4 million tonnes of anti-matter every second. Which, for comparison, is roughly a cube of basalt (the densest rock) 100 metres on a side. With something as dense as the material inside a neutron star, things are a bit better - maybe 1 cubic metre per second or even much less, though storing such material is hazardous. Hazardous here meaning, "mistakes will briefly make your starship shine as brightly as the Sun". One wonders why aliens capable of such stupendous feats of engineering haven't, in the Trek universe, just invented warp drive like everybody else. But let's assume they didn't. My initial thought would be that alien ships moving away from Earth that have been travelling for millennia sounds very much like the Voth. 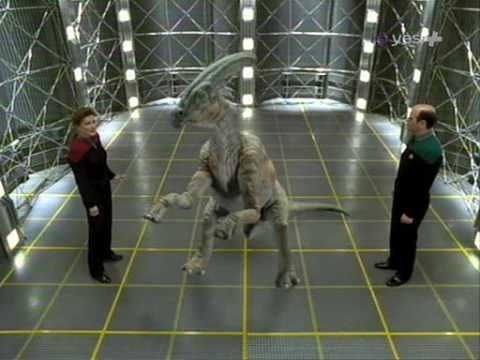 In Voyager, we learn that a bunch of dinosaurs managed to escape Earth before the asteroid hit (presumably before they even knew it was coming, otherwise deflecting an asteroid would certainly have been easier than launching a fleet of starships), eventually settling in the Delta Quadrant. The Voth are pretty advanced by Federation standards - they have transwarp drive and transporters which can beam aboard whole starships. But they're not nearly as advanced as one might imagine for a species that's been space-faring for 65 million years, and their politics is positively medieval. That suggests a generally very slow pace of development. They also command vast resources, with at least one spaceship that's tens of kilometres long. They sound ideal. A species that's left Earth and has been travelling across the Galaxy, probably initially in very primitive craft. Presumably they would have travelled in many separate spacecraft travelling in different directions, to increase the chances that at least one of them would survive. So the Voth Voyager encounters need not be the only ones. Given Voth politics, it doesn't seem much of a stretch to suggest that maybe some of those others never even invented warp drive, and that's what 1960's scientists were observing as quasars. But there are problems. The average speed to cross the galaxy in 65 million years is about 400 km/s. That's way faster than anything we have access to today, but it would still take over 3,000 years to reach the nearest star. Which is so long as to make the whole venture pointless, and given the Voth's stupendous feats of engineering, they ought to do rather better than that. We know they can manipulate energies equivalent to that of stars, which for a 10 km spaceship (assuming it to have a mass as though it were made of solid steel) should allow them to reach such a speed in a couple of seconds. There's just no way the Voth - even the primitive ones - can be travelling so slowly. Especially given the redshift of what are supposed to be their ships, which are more than 100 times as great as their supposed initial speed.Worse, if quasars are spaceships, what exactly are we observing ? Their engine exhaust ? If so, we're seeing the engine exhaust rushing away from Earth...which means the ships themselves are heading right for us. At this point I faffed an explanation, "maybe it's the bow-shock of their ships moving through the interstellar medium". Such features do exist around real-life high velocity stars (which are moving much more slowly than real quasars, < 100 km/s), but this is a stupid explanation. Only a tiny fraction of the material directly ahead of the ship would be forced up to the speed of the ship itself; the vast majority will be pushed aside into a tail. Unnamed stars seen with Hubble. The only realistic explanation of quasars for the Trek universe is that they are small, bright objects moving very rapidly away from us. That brings us back to the star-hurlers again. OK, so by invoking some treknological solution, an ancient race of super-advanced beings started hurling stars out of the Galaxy several tens of millennia ago. One thing that worried me is that since no quasars are blueshifted, all of those stars would have to have been close to our own Solar System, suggesting a sort of explosion. That means not only having the mass of an asteroid in anti-matter, but also inertial dampers powerful enough to stop a star from being ripped to shreds. However, as the inquirer pointed out, this isn't necessarily the case. The explosion could have been far away from Earth, if it occurred long enough ago that the stars flung towards us have now moved past us. Or, perhaps the stars were selected from completely random locations in the Galaxy but always flung away from the Galaxy, rather than specifically away from Earth. Redshift tells us about motion along our line of sight, but it doesn't mean the stars aren't also moving - from our perspective - across the sky. So star-hurling it is then. Where does that leave the Murasaki quasar ? Err... floating around in space. That's about all, really. If we're saying that quasars are just ordinary but fast-moving stars, they wouldn't necessarily seem all that weird up close. 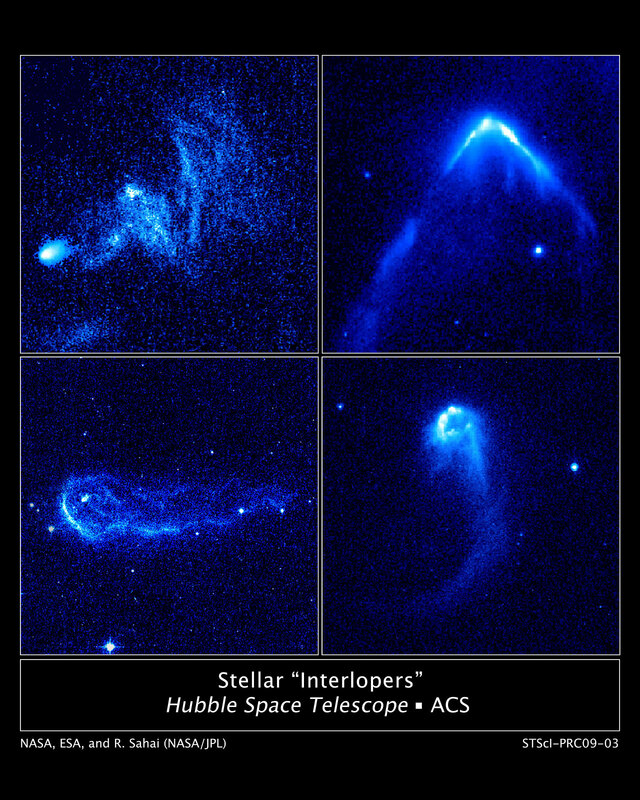 I have absolutely no idea what the bow shock from a relativistic star would look like though. That Murasaki doesn't seem to have one could just a viewing angle effect - since we don't see a bright central source, perhaps the Enterprise was directly behind the quasar. We're given precious little information about Murasaki. It's described as a "quasar-like formation", with "negative ionic concentration 1.64 times ten to the ninth power metres". I don't know what this means. "Ionic concentration" is an odd term, more suited to chemistry. Astronomers would probably talk of "ionization fraction" or just "ion fraction", for convenience - what fraction of the gas is ionized. Why it matters to specify that these are negatively charged ions, I don't know. As for the incredibly clumsy, "times ten to the ninth power", they could have just said "billion" or "giga". I guess they wanted to sound more sciency. And "metres" as a unit of concentration is like saying, "I'd like seven Pascals of sausages, please." Quite. The second piece of information is that the radiation wavelength is 370 angstroms. That puts it in the UV band (almost X-rays), which will indeed ionise interstellar gas. So that one is totally accurate. Finally, we learn that "Harmonics - upward along the entire spectrum". This could mean anything. A harmonic might refer to a multiple of some frequency of radiation, with interference being successively weaker at higher harmonics. Maybe. The entire sector has been ionised : "four entire solar systems" - presumably referring to all of the interstellar gas. Well I suppose as it's travelling through space, it could be shock-heating the surrounding gas, ionizing it. Maybe. In summary, Murasaki itself tells us nothing that prohibits it from being a relativistic star, though nothing that indicates it definitely is one either. What if quasars really were high velocity stars ? Or rather, what if quasars weren't giant, distant black holes ? Much more difficult to answer. Our Universe would require different physical laws, but just how different is impossible to say. No-one had predicted the existence of quasars prior to their discovery - so you might think that implies they're not all that important. The problem with that is that we barely had any understanding our galaxy evolution at all in the 1960's - after all, it was at that time only about 30-40 years since galaxies were proved to be distant objects. Oh, right, yes. Of course. Silly of me. Guess that option isn't available then. Anyway, I have no idea how much we'd need to alter gravity and/or themodynamics, let alone what would happen if we did. Probably nothing good. The second option is to be semi-magical and say that pretty much everything in the Universe proceeded from the Big Bang just as it did in reality, until the point where quasars first formed. At that point, for some reason, they didn't. Exactly how important quasars are in galaxy evolution isn't clear. Oddly enough, the mass of the black hole correlates with the mass of a galaxy's bulge and even the angle of its spiral arms. 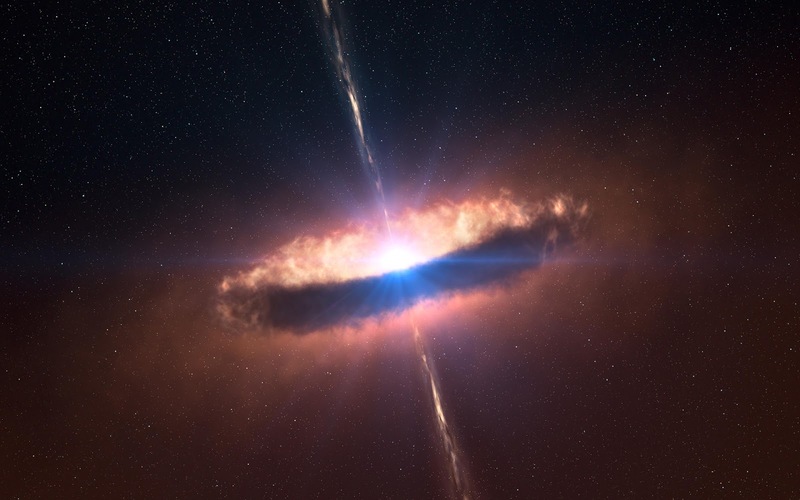 There's probably some underlying common connection between the two, so preventing quasars might necessitate dramatic differences in galaxy structure. Would this prevent the Universe from being habitable ? My guess is probably not. Many simulations have reproduced the basic features of the Universe without invoking quasars at all. That doesn't mean there might not be massive differences in detail though : totally different star formation histories of galaxies, different structures, maybe the wrong numbers of dwarf galaxies... all kinds of things. But I can't see any obvious reason why lack of quasars would lead directly to a lack of a Federation. Why are the aliens doing this ? What, you mean hurling random stars out of our galaxy at tremendous speed ? The questioner suggested that it might relate, somehow, to the creation of the Galactic Barrier that (in Trek) surrounds the Milky Way. Possible, but it would have to be an indirect connection since quasars are distributed isotropically. Though I suppose this barrier might surround the entire galaxy like a shell, in which case its depictions in the show shouldn't be taken literally - for one thing, it couldn't be so visible at optical wavelengths, otherwise we wouldn't be able to see other galaxies. or the Barrier of Thinking Two-Dimensionally. 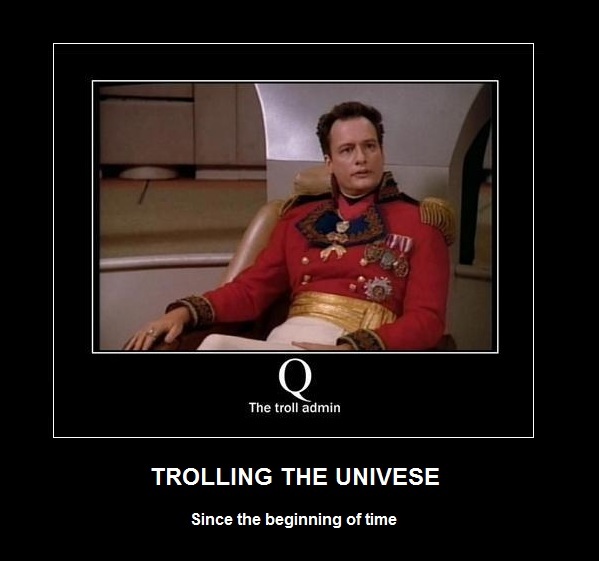 Of course, there's always Q, if we're allowing other Trek series. Q is the sort of entity who would choose to randomly hurl stars into extragalactic space for the sole purpose of confusing bloggers. Which seems an entirely sensible possibility if you ask me. 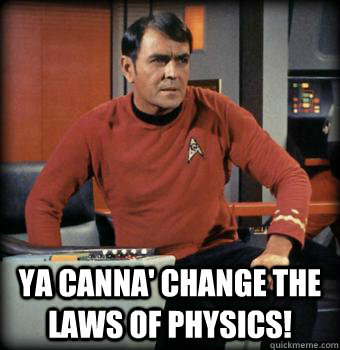 Kirk's standing orders are a bloody nightmare to reconcile with real-world physics, bordering on impossible. It's barely possible to make them fit what was known in the 1960's, but, if we must, relativistic stars seem a strong possibility. No other natural explanation (that we know of) seems to fit - and the power requirements for alien spaceships don't seem plausible, especially given their absurdly slow speeds by Trek standards. As for how the aliens have gone about hurling stars out of the galaxy, I have no really no idea. Their reasons for doing so, I think, are best left as an exercise for the reader.